This pregnancy workout is perfect for moms-to-be who want a safe, effective workout that only uses one piece of equipment. It will work your legs, chest, back and arms. You’ll perform all of the exercises while standing, since the last thing you want to do while pregnant is get up and down off the floor! I just can’t get enough of the resistance band lately! As my belly grows, using dumbbells and barbells feels more and more awkward. I am always looking for new workouts online and got tired of making a ton of modifications to make them pregnancy-friendly. So I decided to stop being lazy and just make up my own – I am a personal trainer after all! This workout is perfect for all expecting mamas, postpartum mamas, and anyone else looking for a workout that is low-impact and uses just one piece of equipment! You can do this workout at home if you have a resistance band, or you can do it at the gym (like I did the first time I did it). The secret to getting the most out of this pregnancy workout is to move as SLOW as you possibly can through the exercises. This puts a greater workload on your muscles and will really challenge you. Bouncing quickly through everything is not going to get you the same results! Before you get started, I recommend doing a 10 minute warm up with the cardio of your choice. This can be jogging, biking, elliptical, etc. If you are going to walk, make it brisk! Get your heart rate up a little. You’ll complete one set of each exercise before moving to the next. When you get through all the exercises, start at the beginning and do it again. I recommend three to five times through the circuit. Isometric squat holds: Begin with feet hips width apart, or slightly wider. Sit back into a squat, your hips should be in line with or slightly above your knees. Squeeze your glutes and hold your arms out straight in front of you while holding your gaze straight out in front. Avoid looking down since it will pull your upper body down. Start counting to 60 seconds. You will likely need a break or two, and that’s totally fine. Just get right back down into your squat after a few seconds and resume counting. Bicep curls: Loop your band underneath both feet. If your band is really tight, you may need to just put it under one foot. Feet will be together or hips width apart. Keep your shoulders down and back while contracting the biceps. You are going to do this veryyyyy slowly! Count to ten each time you bring the band up, pause at the top, and count to ten again on the way back down. One arm row in lunge position: Place your band underneath your right foot, and step back into a lunge with your left foot. You should have about a 90 degree angle bend at your knee, meaning, sink low into that lunge! Your band will need to be pretty tight so you might have to step on it just about a foot down from the handle. 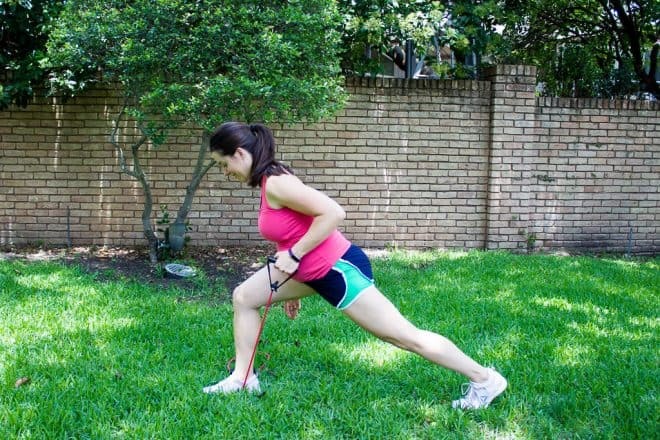 Pick up the band with the opposite arm (if your right leg is forward, hold the band with your left hand). Start with your arm extended down, and slowly contract, leading with the back muscles. Stop when your elbow is about even with your ribs. If you are properly engaging your back, you won’t need to pull your elbow up very high to feel it. Once you complete ten on the first side, switch your legs and complete 10 on the other side. Band pull aparts: You may have to loop the band around your hands a time or two to get the tension right. Extend arms straight out in front, with hands slightly wider than shoulder width apart. Contract your shoulders and engage your core while slowly pulling the band apart until it is stretched against the chest. Pause, then return arms to starting position. Remember: Be sure to check with your doctor or midwife before making any fitness changes, and make sure you are physically cleared to do exercise before starting.